In 1913, as the clouds of war gathered over Europe, island-dotted Stoney Lake remained the serene jewel of Ontario’s Kawartha cottage region. And serene jewel it still is. But back in 1913, the beautiful lake lacked a dedicated place of worship for its Anglican summer residents—until the Rev. Dr. Alexander Mackenzie, headmaster of The Grove, a boys’ preparatory school in nearby Lakefield (now Lakefield College School), launched a campaign to build a church. That culminated in the 1914 completion of St. Peter’s-on-the-Rock. The picturesque white church sits on the rocky shore of an island donated by a local lumberman and landowner with the Dickensian-sounding name of Mr. F.W. Lillicrap. According to Sue Dutton, the church’s historian and member of its 100th anniversary planning committee, fundraisers collected $499.15 in donations for the original simple structure designed to hold 150 people and built by a local farmer. As the congregation grew and became stable, founders Alick and his brother Michael Mackenzie devised a model that is still adhered to today. Their vision was for an incumbent and his family, “ideally from a city parish, to live on the island and to officiate for either July or August,” Dutton wrote in her article on St. Peter’s, “Good Roots.” Accordingly, in 1920, funds were raised and Clergy Cottage was built and furnished the next year. In 1921, the church was extended by 10 feet to the north, allowing for an additional 30 people. When the expanded St. Peter’s was dedicated on July 16, 1922, its furnishings included its trademark shutters, pine pews to replace the old steamer chairs and a new wharf. On Sunday, July 20, St. Peter’s celebrated its centenary in a superb service seamlessly marrying music and worship. The event was actually scheduled 25 years ago and has been in active planning since 2011. Almost 500 people made the July 20 trip by boat from the mainland to the church, in strong contrast to the inaugural service of July 29, 1914: this attracted just 24 congregants and took in a princely $1.75 at the offertory. The sanctuary island itself remains unnamed. “But what’s amusing is that the two channels around it are named Hell’s Gate and Devil’s Elbow, so called by lumbermen because they were narrow and annoying to try to move log booms through,” said Dutton. “This church is very central to the community here,” added Patrick Bunting, chair of the centenary planning committee. “I came here as a child, and my grandchildren attended the anniversary service, so when I look at the front door, I realize that five generations of my family have passed through that portal.” Bunting noted that before 1914, worship and Sunday school were held in local gathering spots and in cottages, some of which are well over 100 years old. 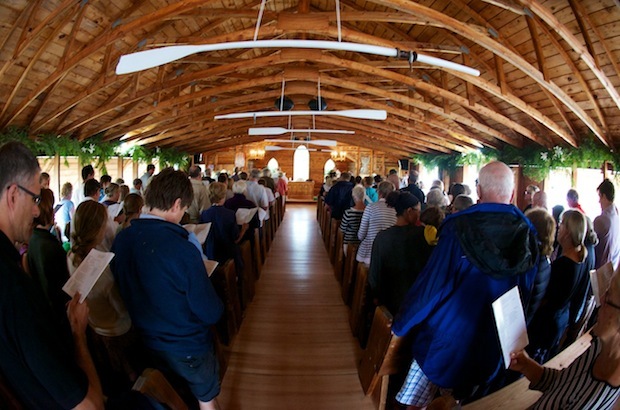 Far from being confined to a single Sunday, the anniversary celebrations encompass a cottage tour conducted two weeks before the service, a potluck supper at a local pavilion on the eve of the service, a jazz vespers to take place in August and a commemorative photography yearbook to be published in 2015. 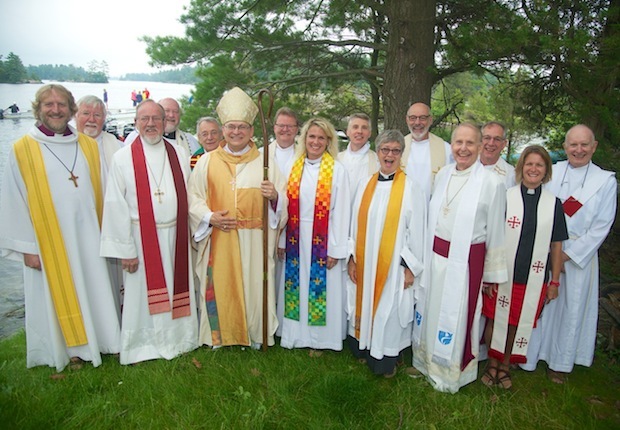 Other priests included Archbishop Andrew Hutchison, former primate of the Anglican Church of Canada, and Bishop Greg Kerr-Wilson of the diocese of Calgary, both of whom served as summer clergy at St. Peter’s and stayed for a month in Clergy Cottage with their families. St. Peter’s has a long history of musical excellence, and a high point of the anniversary service was its musical program featuring vocal and instrumental performances with organ, piano, strings, woodwinds and brass. “The music was beautiful; the service was beautiful. The setting was beautiful,” said Kerr-Wilson.